GIVE and Join the private VIP viewing function! 25 minutes of fireworks for 25 years of Aloha, the longest fireworks show ever in history of Honolulu Festival. Celebrate with us at the Nagaoka Fireworks Private VIP Viewing Function! How would you like to support the Nagaoka Fireworks? As we celebrate the 25th anniversary of the Honolulu Festival with 25 minutes of fireworks, the longest fireworks show ever in history of Honolulu Festival, monetary contribution to help launch the beautiful Nagaoka Fireworks will be greatly appreciated. 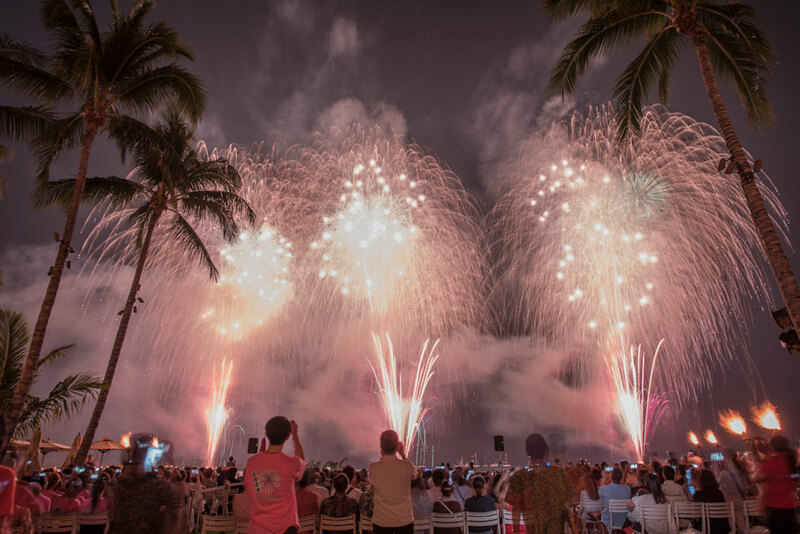 As our gratitude for your donation, you will be invited to the private VIP viewing of the Nagaoka Fireworks show at the ocean lawn, The Royal Hawaiian, a Luxury Collection Resort Waikiki. Enjoy the spectacular show from the best viewing spot with drinks. Your donation will be used for the fireworks, which will be launched in the night sky over Waikiki. Seating: Chairs will be available at designated viewing area ※Seating is limited, standing room. Check-in: Please present a copy of payment with confirmation number ※No Parking validation. Honolulu Festival invites companies and organizations to become a sponsor and support the festival. If you have any questions for suponsorship, please contact us here. The Honolulu Festival Foundation was established in 2000 as a non-profit corporation under Chapter 415B of the Hawaii Revised Statutes. The Foundation is strictly limited to charitable, educational, and cultural exchange purposes under Section 501(c)(3) of the Internal Revenue Code. The primary objective of the Honolulu Festival Foundation is to provide the financial support to execute the annual Honolulu Festival for the citizens of Hawai‘i and its visitors at minimal to no cost to the public. The primary functions of the Honolulu Festival Foundation are to sponsor, maintain, develop, improve and ensure sustainability of the annual Honolulu Festival. By sponsoring and promoting this Festival, the Foundation is proud to make an important contribution towards perpetuating culture, customs and traditions of Asians, Pacific Islanders, and the U.S. mainland. Other goals of the Foundation are to expand community support for the Honolulu Festival and provide economic support for the State of Hawai‘i. Organizers and volunteers of the Honolulu Festival represent a wide array of public and private entities locally and internationally. The Board of Directors of the Honolulu Festival Foundation includes leaders from Hawai‘i’s tourism and retail industries, corporate community and government organizations.